This blog has its origins in an excellent workshop for women in theoretical computer science that I attended in the summer of 2008. Happily, it's happening again! Not only did I learn a lot from the technical talks and have fun networking with the women there, but the networking has been successful in the longer-term as well. One of the sometimes frustrating things about general women in computer science conferences is that you meet wonderful people who you can't look forward to seeing at technical conferences. This workshop is satisfyingly different in that way. I definitely recommend going. We will be holding the Second Women in Theory Workshop at Princeton on June 19-23, 2010.
and view a video of WIT08. A study by the silicon chip giant Intel showed that parents are more willing to talk to their children about drugs than math and science. Yes, really. Drugs are less scary than math and science (at least in the US). News drug dealers all over the country are I'm sure excited to hear. It's a result of their successful campaign to recruit friendly drug pushers. No? It's a result of the declining science education in this country? (Just my speculation here, folks.) Oh, well that could be true too. The economy will suffer if the next generation doesn't have a strong science education. The next generation will suffer if they don't have a strong science education. The second point is, of course, directly related to the first. And so ends National Computer Science Education week. Now go talk to your kids about drugs. You may not have noticed, but this week is National Computer Science Education Week, a week dedicated to increasing the amount of computer science education (especially in high schools). 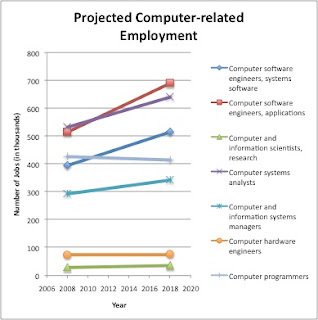 In this spirit, I looked up the US government projections about computer science occupations in 2018 (ten years from the last time they did this analysis). Unsurprisingly, the number of computer science related jobs is expected to increase. Drastically. The subsection with the most increase is "computer software engineers, applications," which is projected to increase by 34%. The total number of new jobs projected is approximately 450,400. In contrast, the Taulbee Survey shows that the total number of bachelor's degrees awarded in computer science and computer engineering in 2008 was 12,815. In other words, if these levels of new graduates continue (and all take jobs in computer science and no other applicants enter the field), there will be 322,250 jobs unfilled, or more than two-thirds of the newly created jobs. The SoCG 2010 paper submission deadline is today. Good luck folks!